Weekend Getaway Destinations Near Atlanta - Good Times Motel & Marina - Steinhatchee FL - It Lived Up To It's 'Good Times' Name! Atlanta Real Estate Brokers is in the business of helping folks buy and sell real estate...but... we also feel it's our job to promote the metro Atlanta area as a great place to live. There are many reasons to call Atlanta home but one that may not be so obvious to newcomers is how close we are to great vacation destinations. Within a few hours drive from Metro Atlanta you can visit places like Blue Ridge Parkway, the Great Smokey Mountains, Myrtle Beach, Nashville, Savannah, and Asheville just to name a few. Then there is Florida. Florida offers a wide array of beach and theme parks and this past weekend, a group of fraternity brothers and I found a new "out-of-the-way" destination that has never been on my map. Our weekend destination was Steinhatchee Fl and the Good Times Motel and Marina. This could be a possibility for your next reunion or get-away and it is just 5 1/2 hours south of Atlanta on the Florida panhandle. 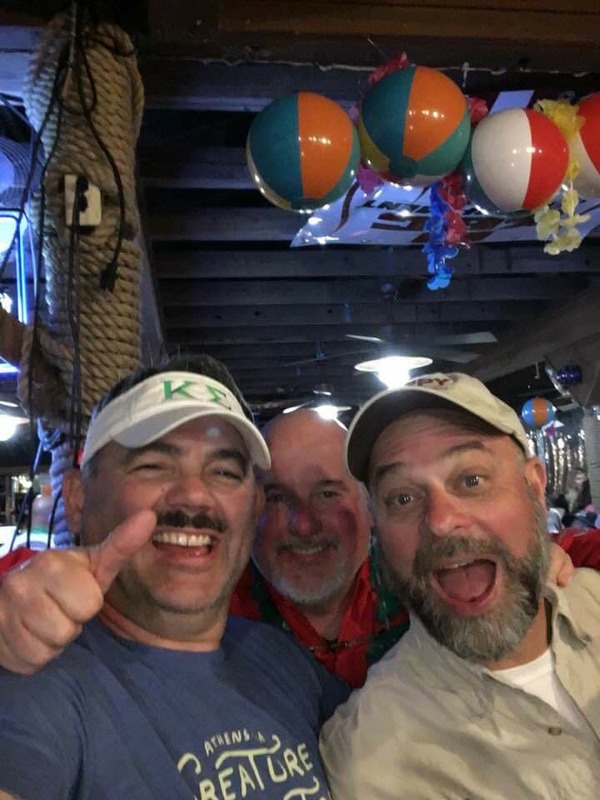 Starting in 2011, 20-30 alumni from the Kappa Sig Fraternity at West Georgia University started getting together to have a little fun, tell a few "fish tales" and perhaps enjoy a beverage or two. The original idea for these trips started with our fearless leader, Steve Beecham. Steve and I were college friends, fraternity brothers and we were even on the WGC cheerleading team together. Shameless plug here...Steve owns Atlanta's Hometown Mortgage and besides being a great mortgage sou rce, he is an accomplished keynote speaker through Bassackward Business with books like "How to Help Without Hustling." Check out Steve at SteveBeecham.com. Back to Steinhatchee....We look for destinations that are somewhat off the beaten path and that offer a blend of entertainment, good food options and outdoor activity. Our past trips have been to places like the North Georgia Mountains, "Live a Little" Tiny Houses at Lookout Mountain Flight Park, Reynolds Plantation at Sapelo Island and more. Heading to the panhandle was a new idea but hey, we were up for the challenge. This years choi ce was a home run! Steinhatchee, FL has a population of roughly 1000 and the town offers various motel options. There are no big chains here so don't come looking. The Good Times Motel was "rustic" but very clean and well maintained. Sherry was our main contact and she did an outstanding job of keeping us organized and inline! The main business in the area is fishing and scalloping in season. The fishing is different in that we were only in 3-4 feet of water "flats fishing" in an area called "Deadman Bay." We fished for trout and redfish but in the summer they fish for those two along with cobia and sharks. 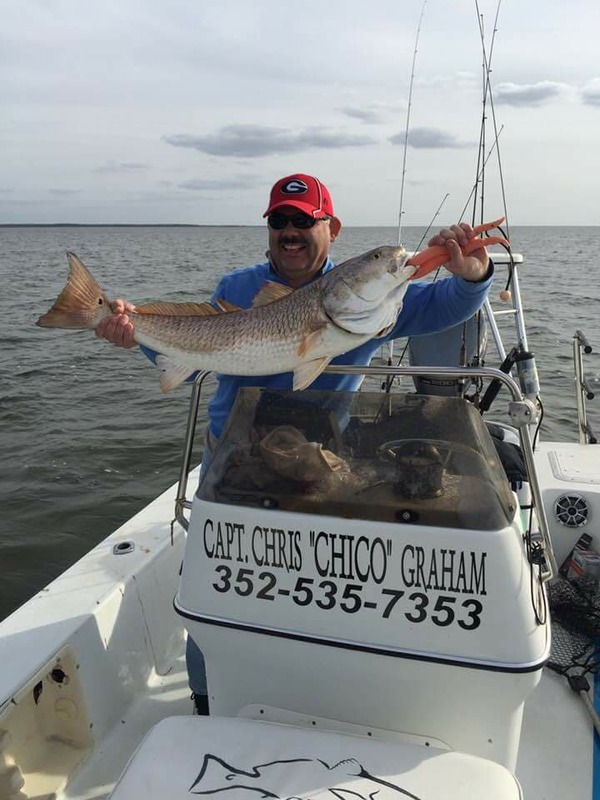 Our fishing captain was Captain Troy Charles and his (click for email) T2 Inshore Fishing Charters. 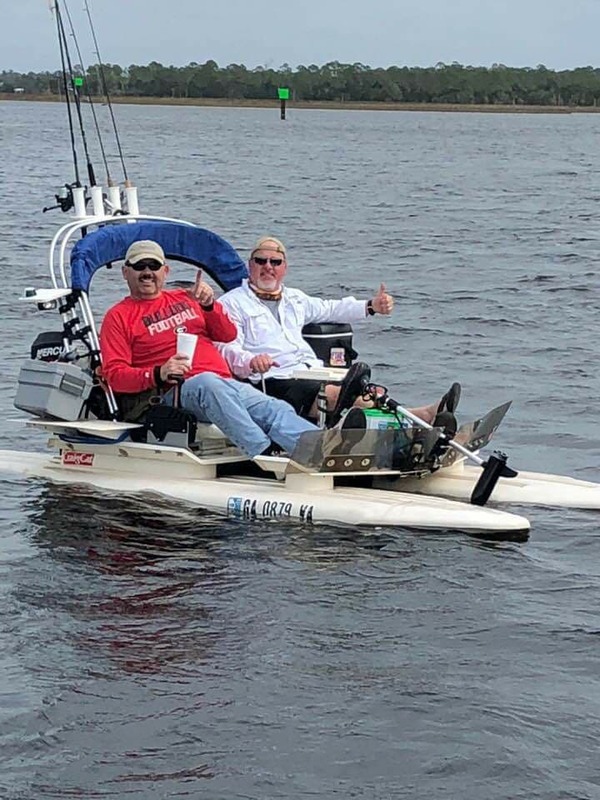 He along with his partner, Captain Chris "Chico" Graham operate from the Good Times Marina and we had a great time, felt perfectly safe and cau ght fish! Most of our meals were at the "Who Dat" Restaurant and Bar which is part of Good Times Motel and Marina. With the exception of breakfast (Bridge End Cafe...amazing and just a couple blocks away), we really did not need to leave as Who Dats serves great food all day and they hosted two dinner parties for us. We had surf and turf one night and a fish fry "beach" party the second...and yes, we caught the fish! The main thing was we were able to enjoy visiting with folks we have known for years. We fished, had a bourbon tasting event and even told a few "fish tales." Here some of the folks are at our Who Dat Beach Party! Other places to eat include: Fiddlers Seafood, Roy's Restaurant, Skullyz BBQ and Hungry Howies. Again, no McDonalds and definitely no Starbucks! There is a very good liquor store in Riverside Liquor and we saw several shops selling beer, wine and necessities. If you or someone you know is looking for a "out of the way" place to get together with a few friends, give the folks at Good Times Motel a call and see what they have to offer. It is not Panama City for sure but it has it's own charm, the food was great and we had plenty of things to do. 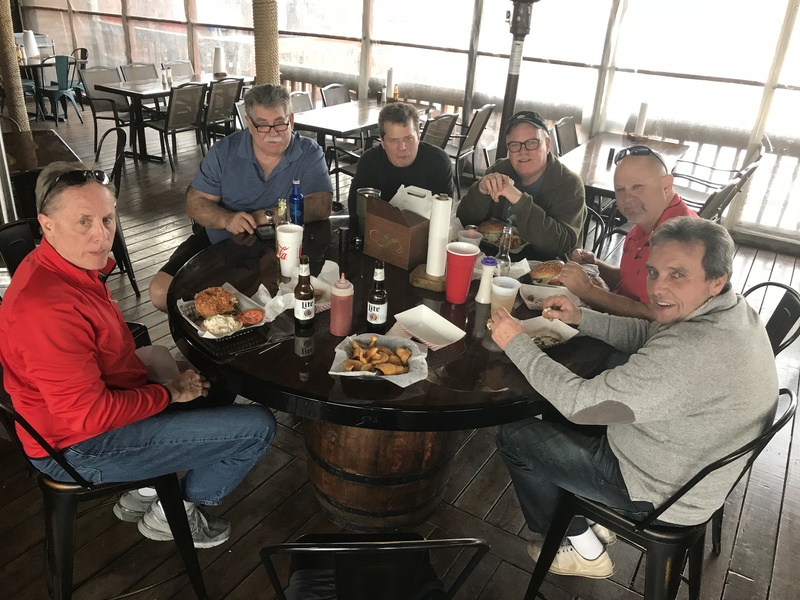 Check out the pictures below from our various outings in Steinhatchee and if you know of a place that is "off the beaten path" and want to share, we would love to hear from you!